Recently right-wing radio, along with some mainstream media; have been having a field day (or field days) regarding alleged RV dumping of black water in Venice. Out of all the propaganda surrounding this, I cannot understand how over 100 gallons of sewage could come out of a holding tank that most likely has somewhere between a 25 and 40 gallon capacity. And the Venice Neighborhood Watch character (seen here in a video http://blip.tv/file/1812907 ), whose credibility has been questioned by community members, was the person who fingered the alleged dumper. 3. The dumping of methane gas into our atmosphere by these livestock factory farms, which is a significant greenhouse gas linked to global warming. If you purchase and consume factory farmed animal products, you are contributing to these public health hazards – not to mention creating a health hazard for you and your family. In fact, these few examples of dumping I have named (and there are more) are well documented public health hazards that many scientists believe will end life as we know it on planet earth, especially if they aren’t reduced or controlled dramatically. Not the people who live in RVs in Venice. So a little perspective is in order here – along with trying to focus on positive solutions. The city and the county could provide some free vouchers for RV dumping at Dockweiler State Beach. They could also open the existing public restrooms at nighttime. Along with a few well maintained port-a-potties – we could solve much of the issues related to the normal human function of peeing and pooing. Considering the millions of people who visit Venice, generating millions of dollars of tourist revenue, it is simply silly that our city councilman has not done at least these few things prior to calling for a highfaluting working group. 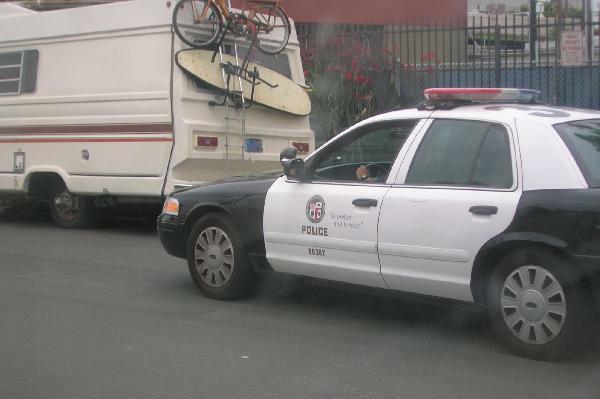 Councilman Rosendahl could also do the humane thing and make sure people living in vehicles had some safe local public parking lots to go to at night before calling for the homeless haters to fill out bogus petitions in order to justify putting in his newly amended oversized vehicle ordinance in Venice. We absolutely need to consider taking emergency measures pertaining to our homeless population, like providing safe public parking lots, because many people living in vehicles are disabled and we are in the middle of an economic crisis that does not appear to being resolved any time soon. Lets not forget that we have the largest Free Clinic in Southern California in Venice. No one in our council office or the city seems to care much about how using law enforcement to harass or remove homeless people from Venice will kill someone who is very sick. Unfortunately, our city has mainly chosen law enforcement, incarceration, and the court system as the non-solution-based answer to homelessness. It costs much more to criminalize homeless people than to house them and our local tax dollars are supporting these heavy expenditures. We tax payers are helping to perpetuate a big festering budget boil that has no cure. It would save money and be much more helpful to those in need if people could get united behind solutions, like building more low income housing or assisted living, rather than hate and fear mongering. And as for that right-wing radio, I think if you listen to those stations too much your IQ will be decreased – if not eliminated completely.